Objectives: To describe and evaluate a domiciliary early intervention service staffed by mental health nurses, and targetting women suffering from psychiatric illness in the perinatal period. Method: A review of the service structure, nurse training and supervision, patient profile, nursing assessments and interventions, consumer satisfaction and clinical response to intervention in a depressed subset of women, was undertaken. Results: 300 women and infants were assessed by the Service in a two year period, with 70% of patients going on to receive a nursing intervention. The majority of patients suffered from DSM-IV major depression or adjustment disorder. Half of all referrals were made "early" (10% antenatally and 39% within 3 months of childbirth) and mean stay in the service was 14 weeks. Consumer satisfaction, both from referrers and patients, was high. Of the depressed subset assessed before and after intervention by the EPDS (n = 84), 85% had a score of <10 at discharge, with a mean reduction in EPDS score from 17.9 to 5.5 (p < 0.01). 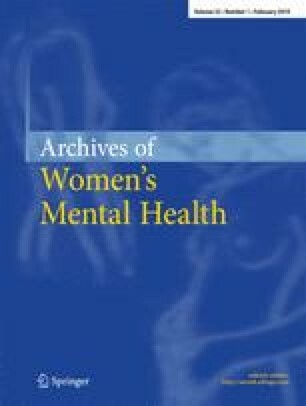 Conclusions: This preliminary evaluation suggests that propriately trained and supervised community mental health nurses, liaising closely with primary health care professionals and service psychiatrists, provide accessible and appropriate early intervention to acutely depressed and anxious women and their infants in the perinatal period. Keywords: Perinatal service; post-natal depression; early intervention.